Kim Leutwyler’s subject, Ollie Henderson, is an activist, designer and one of Australia’s top models. Aged just 26, she has received global recognition for founding the fashion label and youth empowerment project House of Riot, which uses fashion as a vehicle for encouraging young people to start productive conversations about social change in Australia. Henderson is a friend of the artist’s. 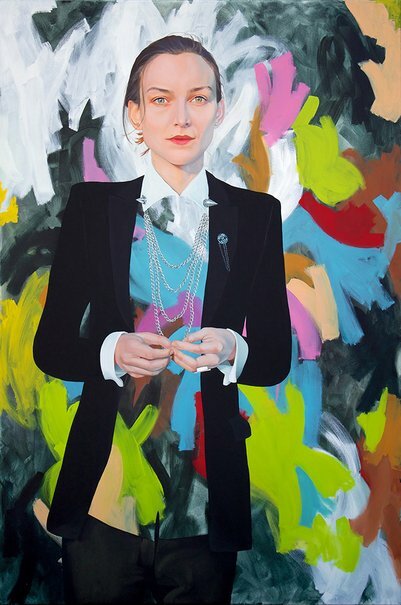 ‘I typically create paintings of LGBTQI-identified and queer-allied women, most recently focusing on those who have impacted my life in some way,’ says Leutwyler. Born in America in 1984, Sydney-based Leutwyler migrated to Australia in 2012. She works in a variety of media including painting, installation, ceramics, print media and drawing. She holds concurrent Bachelor degrees in Studio and Art History from Arizona State University, and additionally graduated from the School of the Art Institute of Chicago with a Painting and Drawing degree. Her artwork has been exhibited in galleries throughout the United States and Australia, and she is part of the collections at both the Naestved Cultural Center in Denmark and the Brooklyn Art Library in New York.